As they say, ‘home is where the heart is’ and in this increasingly digitalised and globalised world, it’s important to remember that your dwelling is more than simply a space to eat, sleep, repeat. It is an area of warmth and safety, a place to spend time with your family, rest, relax and engage in enjoyable pursuits. Today’s property covers all of those bases and more! 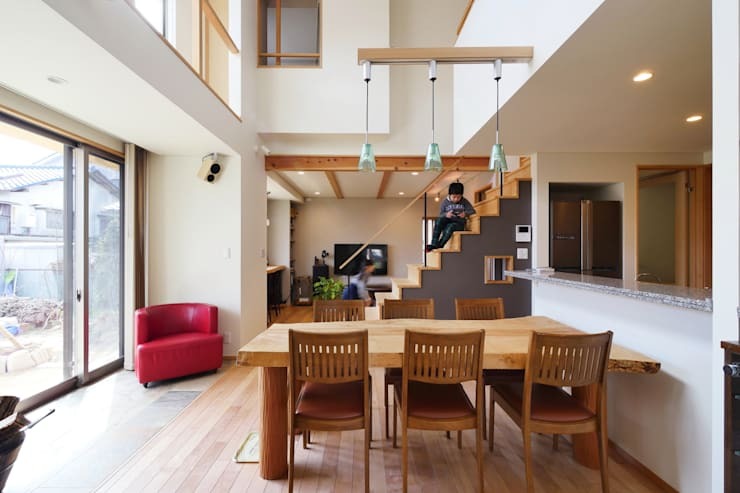 Designed by Kyoto-based architects Ikeda Room, the home is situated in Otsu, Shiga Prefecture, and boasts a total floor area of 150m2. 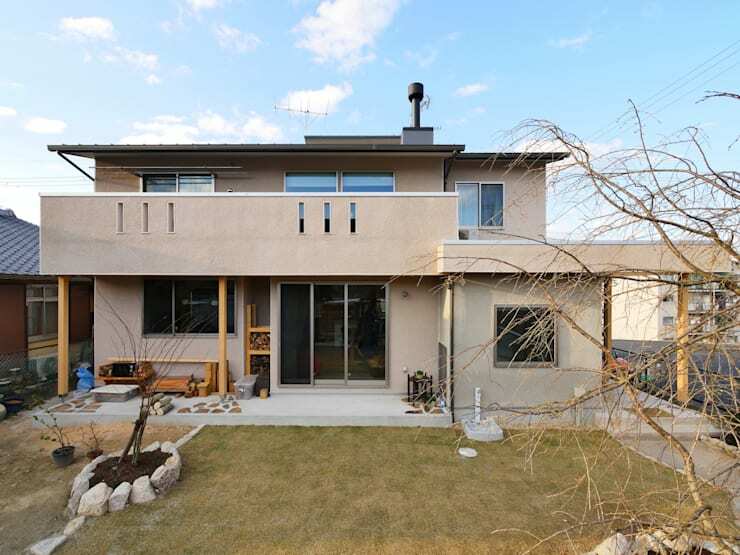 The residence was constructed to reflect the wide variety of recreational pursuits the family enjoys – from gardening and bonsai to entertaining guests and friends. Stylish and sophisticated yet modest and practical, this is definitely one home you’re going to want to check out! As we first set our eyes upon this modern home, we’re instantly provided with a sense of what this dwelling might have to offer. Larger than its neighbour, with a contemporary façade, the earthy-beige façade is modest yet harmonious with the surrounding landscape. As we head up to the entrance we see the gorgeous Zen-like ambience and atmosphere that oozes style and sophistication. The stone feature wall sits at the back, while a small window has been added to let in light. 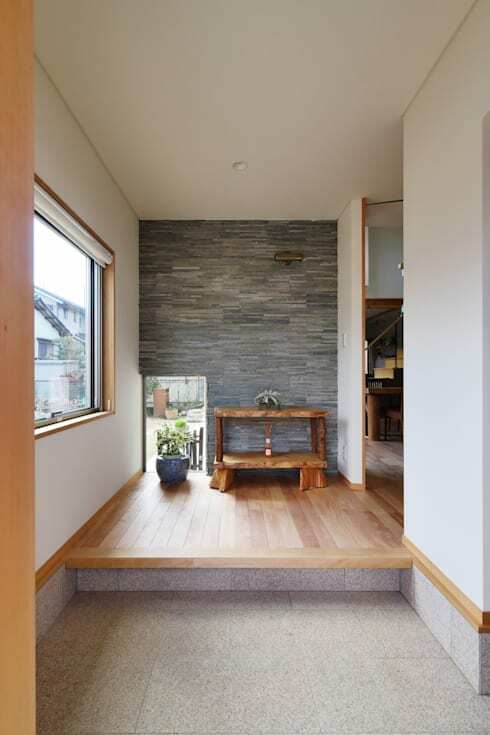 Like many traditional homes, this modern dwelling boasts a sunken entry, with visitors encouraged to remove their shoes in the tiled section, before proceeding up to the timber floor space. As we enter the living spaces the brightly illuminated room, and the huge double-height ceiling immediately blow us away. Truly a gorgeously designed space, this multi-purpose room definitely provides an impressive idea of life in this modern abode. The dining room takes a central position, located conveniently next to the kitchen, while an interesting set of lights hang directly over the table. The breakfast bar is not utilised as such, but rather allows the dining table to sit closer to the overhang, leaving a good amount of room from the sliding glass doors. 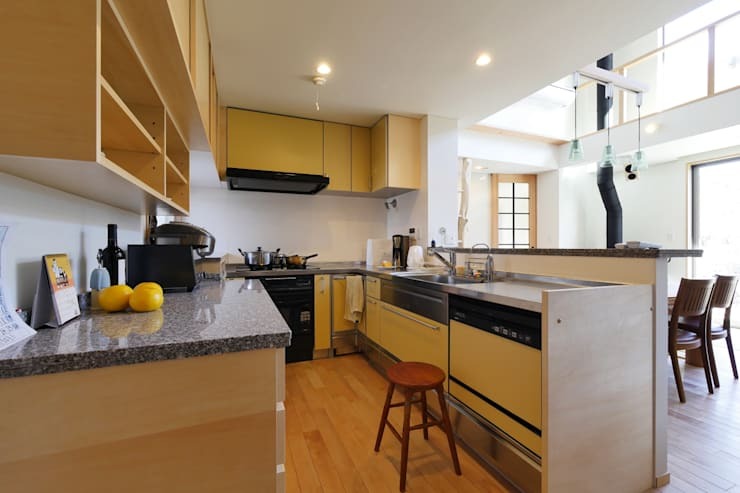 Cheerful and lively, as we enter the kitchen we’re shown the vibrant yellow joinery, and the U-shaped layout of this versatile cooking area. Boasting stainless steel and granite countertops, state-of-the-art appliances and plenty of storage space, this room is certainly an important gathering space for the whole family. One part utility room and one part dressing room, this is definitely one of our favourite spaces within this dwelling. 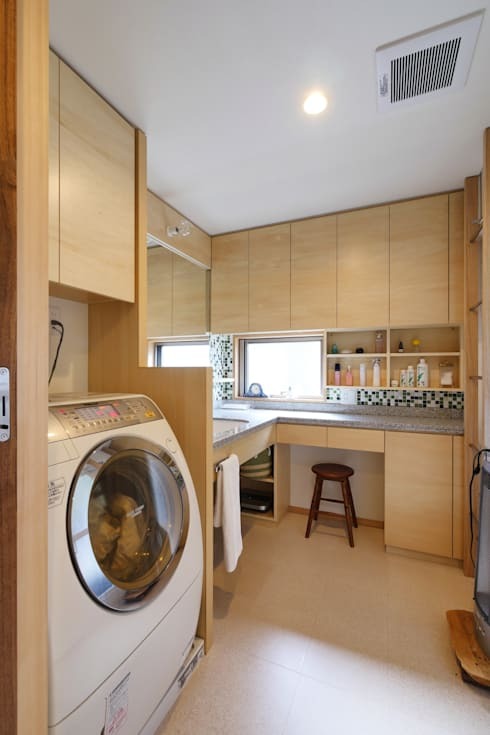 The large washer sits within bespoke joinery, while the room is extra spacious with room for folding, ironing, and even getting ready for an event. Perfect for the children to sit and complete their homework while the parents cook dinner, this area is a multi-purpose studio. The built-in bench is customised from the same organic timber shapes that we saw in the dining room. Ideal for an array of tasks, this room makes the most of what might have been an awkward area to design. Coming to the end of our tour we head inside the recreation room. 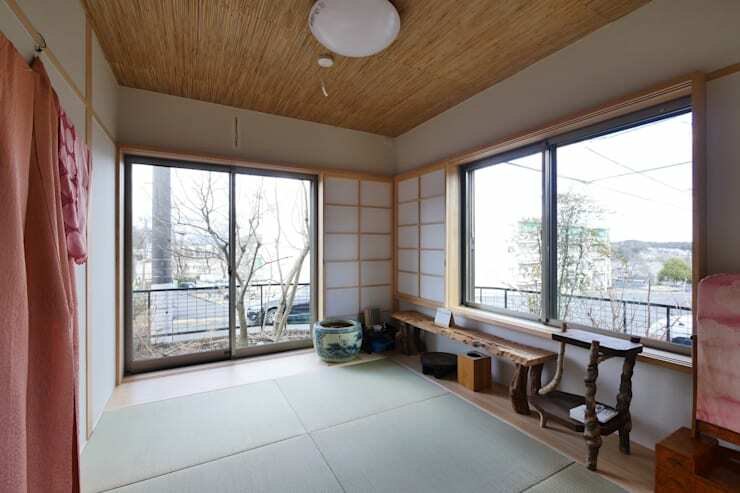 Decorated in traditional tatami mats, the space is restful, relaxing and suitable for a range of purposes. 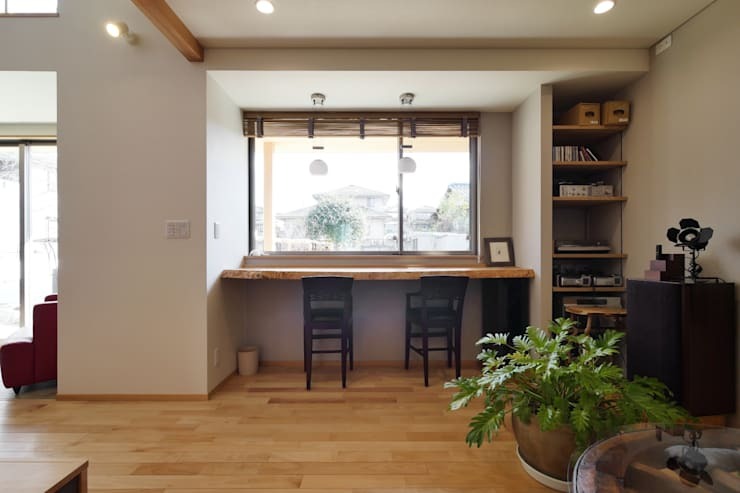 What makes this area even better are the large windows that can be opened in the summer time to let in an abundance of fresh air, while they offer plenty of light during the cooler months too. Last, but certainly not least, we head into the bedroom. 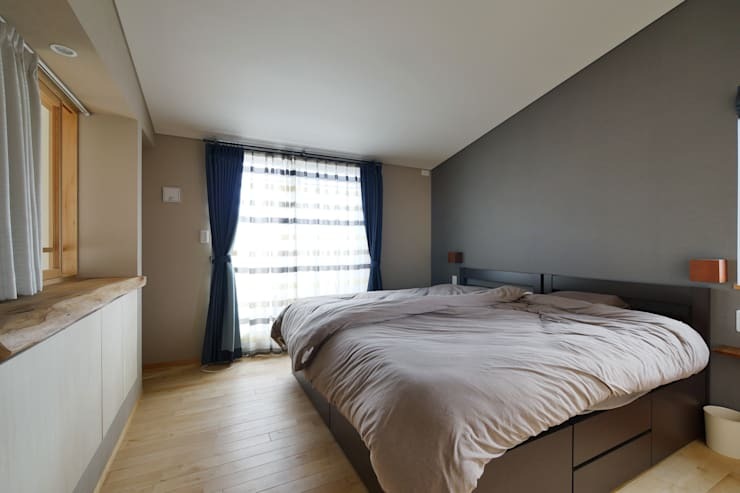 Designed minimally, this sleeping space follows a similar aesthetic and ambience seen throughout the other areas of the home. Large windows provide ample natural light, while the windowsill has been constructed from a large plinth of timber. The colour scheme is muted yet sumptuous, with a dark grey feature wall offering a sense of class and depth to the space. What did you think of this modest and sophisticated home? Let us know below!